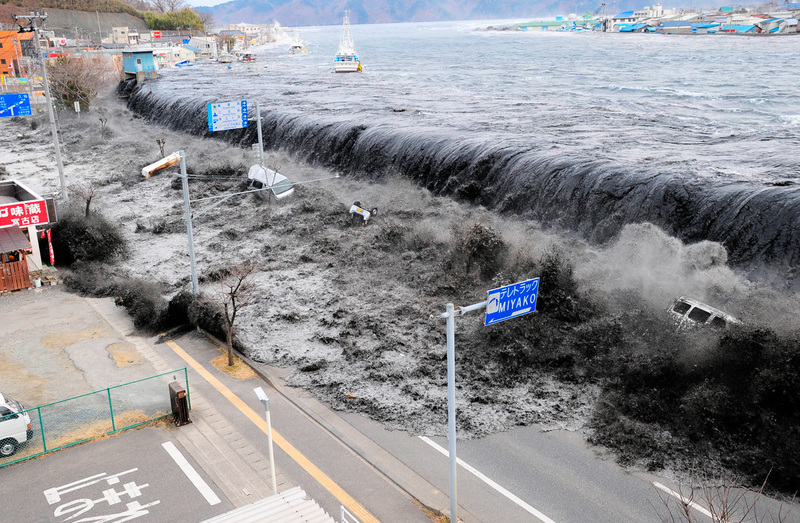 This is part 6 of our ongoing reporting with many updates about the massive 8.9 9.0 earthquake / tsunami which struck Japan on March 11 2011. For an actual in-depth report on damage, fatalities, injured, etc please consult our "CATDAT Excel Sheet" or our "CATDAT Graphic". UPDATE 09:18 UTC : While the construction of temporary accommodation has started in some Prefectures, many areas are finding it very difficult to find suitable pieces of land to build upon. The coastal area in Tohoku is mountainous and it is difficult to find plots of land that are flat. UPDATE 08:47 UTC : On top of the damage misery, freezing temperatures are hampering relief efforts. Positive news however is that relief items are reaching the affected areas. UPDATE 23/03 - 08:05 UTC : We have updated our CATDAT damage excel file (see link on top of this page) to include all FDMA and Police reports issued until now. UPDATE 23:46 UTC : The Japan Police corps has given a new update. 9,199 people have been confirmed killed and 14,000 are being listed as missing. UPDATE 23:43 UTC : The US navy has dispatched 13,000 troops, 20 naval vessels and 140 aircraft to help the Japanese emergency services with the many different tasks they still have to do. UPDATE 23:35 UTC : The general situation at the Fukushima Daiichi Nuclear power plant was further improved as power was restored to the control room of the troubled reactor nr 3. Thermometers are also working again at 3 reactors. This was the situation before the aftershocks discussed in detail here. UPDATE 23:16 UTC : Iwaki has a population of 357,309. A lot of people will have been moved from this dangerous area after the mainshock. Many people are also staying in shelters. UPDATE 23:14 UTC : Aftershocks of the aftershock are continuing top rattle the Fukushima area. UPDATE 23:08 UTC : The aftershocks come at a really bad moment for the nuclear plant who was gradually improving the situation. UPDATE 23:03 UTC : The 07:16 local Japanese time has been recorded by JMA as a shallow M 6.0 earthquake. Below land and shallow (close to the surface), this earthquake can be damaging. UPDATE 22:55 UTC : JMA (Japan) has categorized the intensity of these aftershocks as a 5+ (on a scale from 0 to 7). The aftershocks are especially dangerous because the area has been hit before on March 11 and by the many strong aftershocks afterwards. Some buildings are not yet stabilized. 2 very dangerous strong aftershocks 20 minutes separated and close to Iwaki. UPDATE 18:28 UTC : Good News : All six reactors at the troubled Fukushima Daiichi nuclear power plant were reconnected to external power. UPDATE 14:21 UTC : High radiation levels have been detected as far as 40 km from the power plant. It is clear to earthquake-Report that a vast area surrounding the plant will have to be evacuated for a very long time, as the government will not allow any risk for the people of the radiated areas. UPDATE 14:18 UTC : An Australian high pressure water cannon did arrive in Tokyo to aid the cooling operations at the Fukushima Daiichi Nuclear plant. The pumps will be operated by Japan Self Defense Forces. UPDATE 14:14 UTC : Rain and snow will make cleaning operations more difficult in some affected areas. The temperature will be dropping around 0°C on Tuesday. UPDATE 14:00 UTC : The police have listed a new death toll of 9,080 with an additional 13,561 missing. The FDMA statistics are mirroring more and more the Police statistics. We are waiting for further updates from the cities and towns in Miyagi province as to building damage estimates, but have estimates of up to 85,000 additional destroyed or partially destroyed buildings in this prefecture, using shelter and individual city estimates. UPDATE 12:44 UTC : A lot of strong to very strong earthquakes today but luckily at a safe distance from the coast. JMA has reported only 4 intensity. Today is certainly a very active tectonic day with 2 M 6.6 and 1 M 6.4 aftershocks. Another VERY STRONG aftershock approx. 100 km out of the Miyako coast. Categorized as JMA 4. Next to our earlier published Excel damage sheet, we have also created a GRAPHIC PDF which enables our readers to have a better and quicker overview of the actual situation. UPDATE 22/03 - 07:35 UTC : Very heavy but harmless aftershock out of the coast of Iwaki. The aftershock has a Magnitude of 6.6 at a depth of 26.5 km. The distance to Minamisoma is at least a secure 250 km. There is NO tsunami warning in place. GDACS just issued a GREEN earthquake alert. UPDATE 13:26 UTC : Every new report from FDMA and the Japanese Police, the death toll is climbing again and again. At this moment 8,649 people have been confirmed dead and 13,261 missing. UPDATE 21/03 - 13:11 UTC : We just published a new update of the CATDAT summary of damage, injuries and fatalities. The most extensive statistics on the Internet outside Japan. Click on this link to view the spreadsheet. Iwate prefecture has the highest intensity value. Aomori, Miyagi and Akita intensity JMA 3. UPDATE 10:35 UTC : The unthinkable resulted in a happy end for 2 people in Ishinomaki as they were rescued to safety after an incredible 9 days. The rescue of the 80 year old woman and a boy from 16 years can be really called miraculous. UPDATE 10:33 UTC : The Fukushima nuclear reactor no. 3 is not yet in a stable Safe condition but engineers decided NOT to release radioactive steam against their earlier intentions. Japan Self Defense forces sprayed 80 tons of water on reactor nr. 4, and have ended this operation. UPDATE 08:02 UTC : Version 6 of James Daniell CATDAT Sendai / Great East / Tohoku Japan earthquake database has been uploaded. Click on the link on the upper part of this page to have an overview of the present situation. We are publishing based on location and prefecture, the number of Population, Fatalities, Missing, Injured, Seriously Injured, Collapsed houses, Partially destroyed houses, Partially damaged houses, Total Fires, etc. etc., too long to mention it here. This material can also be used for scientific purposes. Republishing is allowed ONLY if CATDAT, James Daniell and Earthquake-Report.com are mentioned on top of the article. UPDATE 20/03-00:12 UTC : A huge media story 8 days after the earthquake, showed a man who was miraculously rescued. The miracle rescue came 1 day after the Search & Rescue teams stopped their search to find survivors. This man proved that the SAR people were wrong. NO, they were not wrong. The man did fled in time to higher grounds and stayed many days in an evacuation center nearby. On the day that he was detected and rescued, he simply went to his collapsed house and was "found" by rescue people wrapped in a sheet against the cold. UPDATE 22:48 UTC : The situation at the Fukushima nuclear power plant is slowly improving. Two reactors are now connected to external power, a vital element for safety. JMA description of 5+ : "Cracks in the walls, overturning of gravestones, stone lanterns etc., damage to chimneys and stone fences." "It is considerably difficult to remain standing. In houses, slight damage is generally sustained. A soft ground can split or break. Unstable furniture falls over." Unfortunately the combined death/missing toll has risen to over 19,000, with around 7500 killed and 11600 missing. Miyagi continues to be the worst hit, with Iwate and Fukushima also having large losses. UPDATE: Situation Report 5 from CATDAT and earthquake-report.com is now available. CLICK ABOVE! Unfortunately the combined death and missing toll has risen to over 18,000. CATDAT and earthquake-report.com present the 4th public damage report combining all manner of Japanese sources. It will be online in a few minutes under the above link. The casualty total has risen substantially again today. 6,911 are dead, and 10,754 are missing. You can click on the CATDAT Summary of Sendai Damage above for all information. The worst affected prefectures are Miyagi (4030 killed, 2214 missing), Iwate (2223 killed, 4253 missing) and Fukushima (602 killed, 4282 missing). In other news, the reactor problems continue, however this will hopefully be resolved by the end of the weekend, with reports coming through of lower temperatures. UPDATE 07:55 UTC : Unfortunately some very bad news too : The death toll has increased to 6,539.
earthquake ever to hit a developed country. As of 07:00 UTC 18/03, the National Police have said that 6539 have been killed, and 10354 are missing, mainly from Iwate, Miyagi and Fukushima Provinces. UPDATE 07:55 UTC : More good news at the Fukushima nuclear power plant where SDF (Japan Self Defense Forces) were injecting water in the reactors with fire trucks. TEPCO, the power plant owner, is trustfull that the cooling systems may be restored on Saturday. This would be great news as this would end the superdangerous nuclear accident. UPDATE 07:50 UTC : At least some good news for the Honshu coastal settlements struck by the tsunami. The magnitude and frequency of the aftershocks is continuing to decrease. Since midnight UTC only 3 aftershocks were recorded at values of 5.2, 5.4 and 5.5. UPDATE 23:20 UTC : Nearly 300,000 people are being accommodated in 2,200 shelters. In, Miyagi Prefecture 166,000 people have found a shelter, Fukushima Prefecture 47,000, Iwate Prefecture has 48,000 evacuees and the Kanto region (includingTokyo) 20,000. UPDATE 18:57 UTC : Let's bring some positive news on Fukushima nuclear power plants. Radiation decreased a little after the Japan Self Defense Forces injected water by pump trucks. UPDATE 15:57 UTC : All actions to cool down some of the Fukushima Daiichi nuclear reactors by helicopter seem to have failed. More engineers are on site to determine what to do next. International nuclear specialists are emphasizing that this tragedy cannot be compared with the Tjernobyl accident, which was a lot more damaging and carried more health risks to the people living in a wide radius around the plant. UPDATE 15:46 UTC : A powerful aftershock of magnitude 5.8 at a depth of 30 km occuured along the Fukushima coast. The max. JMA value was 4 for some locations in the following prefectures : Fukushima, Miyagi and Ibaraki. UPDATE 15:27 UTC : Many thousands of people will have been killed by the tsunami on March 11 having faith in the special Tsunami barriers who had to protect them from the violent sea. A big number of these so called Tsunami walls were simply washed away. Kamaichi is a perfect example of such a destroyed town fortified by huge concrete reinforced tsunami walls. The earthquake-report conclusion : in case of an very powerful tsunami, nr. 1 measure : EVACUATE TO HIGHER GROUNDS !!! UPDATE 14:41 UTC : Missing up to 9522. CATDAT Update v2 including all known damage has been uploaded. Click here to visit this page. give an in-depth summary soon. In other news, for the Sendai Quake the death toll has risen to 5692, and the missing toll to 9506. This brings the total to 15198 people. are coming through that the temperature of the reactor is not reducing in the last ditch effort. article in the press using CATDAT data. list. Click here to visit this page. high pressure water cannon started. UPDATE 11:08 UTC : After reviewing the JMA data we can conclude that this earthquake which affected the Aomori and Iwate prefectures was recorded at a magnitude of 5.8 at a depth of 20 km. The value of the JMA scale (O to 7) was max. 4 (compared to a 6 or 6+ for the March 11 (tsunami) and March 15 Mount Fuji earthquake. UPDATE 10:49 UTC : A very strong aftershock in the coastal area of Iwati prefecture and about 30 km from Kuji, has been experienced by the Kuji people as a VI MMI. As a lot of buildings have been damaged by the violent shaking f the March 11 earthquake, a VI MMI can be the shaking too much. This earthquake is an aftershock in the same faulting area than the March 11 mainshock, but at a totally diffrent location. It is very concerning that these very strong aftershocks are starting to shake totally different areas. UPDATE 10:43 UTC : According to Japan National Police, who is the countries official spokesperson, 5,583 people are confirmed killed and an additional 9,594 is still missing. UPDATE 10:41 UTC : Japan is very upset that so many governments in the world are asking their people to leave the country. Most of the governments are taking this decision because they feel that on top of the earthquake-risk, the Japanese authorities are not trustworthy on their nuclear radiation reports. UPDATE 10:34 UTC : Earthquake-Report has refreshed his very detailed CATDAT list, summarizing the fatalities, injured, etc statistics per prefecture and city. Click here to visit this page. UPDATE 17/03 - 07:57 UTC : Official sources have confirmed that until now 5,198 deaths have been counted. 9,429 people are still missing. This number of missing people reflects only the number registered with the authorities. Official sources now say that the final number may be in the tens of thousands. UPDATE 16/03 - 22:20 UTC : U.S. troops, helping the Japanese with the tsunami aftermath, have to stay away at least 70 km from of the damaged Fukushima Daiichi nuclear plant. UPDATE 21:57 UTC : We just published a new version of our damaged Prefecture and Cities list. Click here to visit this page. UPDATE 21:50 UTC : Japan's Emperor Akihito appeared on National TV to express sympathy for people affected by the cruel Tsunami. UPDATE 19:00 UTC : The number of fatalities have risen to 4,340 with 9,000 people missing, which brings the total of assumed killed people to 13,340. UPDATE 08:53 UTC : The number of fatalities have risen to 3,771 with 8,181 people missing, which brings the total of assumed killed people to nearly 12,000. UPDATE 08:50 UTC : The Fukushima nuclear power plant accident situation is still unclear, but at the positive side, we can report that the plant workers are again allowed in the power plant (they have been ordered to urgently evacuate on Tuesday). UPDATE 08:46 UTC : 80,000 Japan Self-Defense Forces are working day and night in the continuing Search and Rescue operations. The chance of finding survivors diminishes by the hour due to dehydratation and winter conditions (freezing cold and snowfall).